Second Annual WMBriggs.com Bad Science Award! 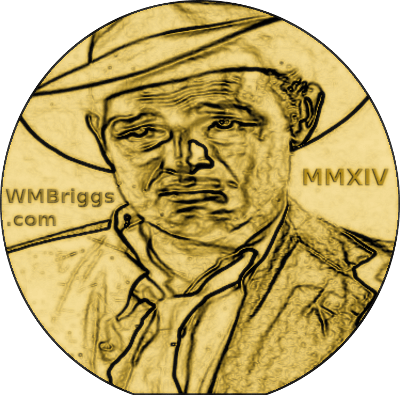 In the proud and rarely abused tradition of Honoring Important People, we present the Second Annual WMBriggs.com Bad Science Award! Please help us pass on the news of this momentous distinction by Tweeting, Facebooking, Emailing, Phoning and the like. Alert reporters! Notes in bottles would not be out of place, where this not a gross affront to The Environment. The winner receives our humble thanks and a copy of the valuable coin-like image above (should they choose to log on to the site and download one). Looks just like the Nobel, eh? Eh? Only researchers who published peer-reviewed papers in journals of good standing were considered. Mere mistakes weren’t enough, nor banality; nor was fraud of any kind a qualification. Cheaters are considered comedians who do us an essential kind of service, unlike Bad Scientists, who are inherently harmful. The WMBriggs.com Bad Science Award—or WBSA, as it will soon come to be known—can only be bestowed on researchers who were in earnest, whose results were excruciating, results which could or did serve as a focal point for the propagation or base of error for other scientists or which did or will cause an increase in Sinful Scientism. We’re talking smelly. 2014: The First Annual Award went to Kathleen H. Corriveau, Eva E. Chen, and Paul L. Harris in an effort our judges (me) called pure putrescence, for their “Judgments About Fact and Fiction by Children From Religious and Nonreligious Backgrounds” in the peer-reviewed journal Cognitive Science. Mark Urban for claiming global warming will kill 1/6 of all species in “Accelerating extinction risk from climate change” (detailed entry). Jean Decety, Jason M. Cowell, Kang Lee, Randa Mahasneh, Susan Malcolm-Smith, Bilge Selcuk, and Xinyue Zhou for pretending to have proved religious kids are less “altruistic” in “The Negative Association between Religiousness and Children’s Altruism across the World” (detailed entry). Elina Einiö, Jessica Nisén, and Pekka Martikainen for the-answer-is-obviously-no study “Is young fatherhood causally related to midlife mortality? A sibling fixed-effect study in Finland” (detailed entry). Rachel Margolis and Mikko Myrskylä for claiming parenthood is worse than divorce, unemployment, or the death of a partner in “Parental Well-being Surrounding First Birth as a Determinant of Further Parity Progression” (detailed entry). Colin Holbrook, Keise Izuma, Choi Deblieck, Daniel M. T. Fessler, and Marco Iacoboni for claiming they can treat belief in God with magnets in “Neuromodulation of Group Prejudice and Religious Belief” (detailed entry). According to Science!, ladies and gentlemen. It doesn’t get much worse than that. Congratulations to our winners and a hearty thanks for providing us with a smile. It’s never too early to send in those nominations for the 2016 award! A candidate for next year. There is one more sciencey nominee hidden in the first “detailed entry” link! I’d have gone with global warming increasing bad music because it was so nonsensical, but it was a close field there!! I’ll be on the watch for next year. The Holbrook paper should have won, since it was bad not only in psychology, statistics, but worst of all in physics. Perverting physics is a much more serious fault and difficult to do than perverting statistics, and much harder to do. Perverting statistics is easy–done all the time; not so with physics. No, the global warming causes everything trope has been around too long to make that particularly noteworthy. I think it’s probably true that religion is bad for children, for a host of reasons. Nice set of finalists – all good examples to be cited in support of the idea that the social sciences aren’t sciences. May I suggest, therefore, that these become the annual Pseudo Science awards? Haha. I had missed the first one you did! This is a fantastic idea. Really humiliate the idiots who are faking empiricism to push garbage. Yeah, sounds legit. Somebody definitely didn’t make that up at the local smoothie bar. Truly, Briggs, you are as close as the Reactosphere has to a ‘national treasure’. I smile when people start a sentence like that, and the words that follow don’t matter. In other words, you don’t know what is true. The disparity between those that “think” and those that “know” is never more apparent than in the words used to communicate. But physics is already perverted. What is scientific cosmology but a litany of absurdities?. What is many-worlds interpretation? Quantum mechanics is still laboring under a fallacy of equivocation that was noted by Stanley Jaki. Too many examples of this sort can be given. There is observer-as-creator idealism of Heisenberg and Bohr that is still flourishing among physicists. Schodinger’s cat shows that the physicists show no appreciation of biology–they think they can make formal mathematical superpositons out of non-formalizable notions of living and non-living. Perhaps it’s difficult. But the Monckton et al. paper demonstrated that our host and his colleagues were equal to the challenge. Joe Born: Apparently, understanding papers is not your strong point. Does that mean you swallowed Monckton et al.’s equation 1? Does that mean you accept believe its statement that “the voltage transits from the positive to the negative rail” when the loop gain reaches unity? Does that mean you believe the Table 2 heading’s statement that all of the table entries were “derived from” the Roe paper? Does that mean that you accept the logic of its Section 9’s claim of skill? Does that mean that you see nothing wrong with the “unstable response” legend in its Fig. 5? Does that mean you believe that the authors ever demonstrated any relevance to their purported “process engineers’ design limit” or show it was anything other than a figment of Christopher Monckton’s imagination? If so, I would be interested in seeing a reasoned defense of any of those points. So far I’ve seen only bluster from the authors. From experience, I don’t expect most people to understand the problems I just mentioned. But they assume that Lord Monckton wouldn’t have responded with such confidence if what I said had been valid. If he’s willing to exercise some critical thinking, though, even a layman should be able to see why Equation 1 is ludicrous. Now suppose you suddenly close the faucet. Does the accumulated water disappear instantaneously? Of course not. But that’s what Monckton et al.’s Equation 1 says would happen. Look at the equation: delta F = 0 means delta T = 0. If you accept, despite your everyday experience, that the accumulated water would disappear instantaneously, then you’ll see nothing wrong with Equation 1. Otherwise, you should question it and much else that’s in that paper. Joe Born: You’re right. I can’t just answer this without research. It may take some time but I am curious and will definately look at your questions and see if they make sense to me. Note—I don’t believe anything Monckton or anyone else says just because they say it with confidence. That’s not how I work. If you do plan to study that paper, you may want to take a glance at my posts here and here. They describe a few of the paper’s problems. I must confess, though, that they proved to be pitched at a technical level a little too high for most of the audience. The truth is that the “model” upon which the authors based their “finding” is just this: 0.26 K per W/m^2. That’s it. You multiply a forcing trend by that value to get the resultant temperature trend. That’s the sole basis for the projection in their paper’s signature Fig. 6, the one on which they base their claim of model skill. It is said that the paper’s “irreducibly simple” model was “developed over eight years.” Yet anyone who has a modest command of math could come up with a “model” at least as good before breakfast by just putting forcing and temperature data on a spreadsheet. All you have to do is divide an observed temperature trend by the corresponding trend in forcing. I have no doubt that similarly low sensitivity values can be arrived at by what could indeed be justifiably characterized as “using physics.” In the case of the Monckton et al. paper, though, what in the authors’ view apparently passed for “using physics” was merely their unsupported statement that “810,000 years of thermostasis suggest” a [-0.5, +0.1] range for the loop gain fg in the closed-loop-gain equation h = g / (1-fg). Sure, the mean of their postulated range does cause a 1 Cº value to result from an assumed 3.7 W/m^2 doubled-concentration forcing-change value if the IPCC-suggested value of 3.2 W/m^2 per kelvin is used for the reciprocal of open-loop gain g. But what is it about that “thermostasis” that suggests Monckton et al.’s range instead of, say, a range of [-2, -1] and thus a mean sensitivity of 0.5 Cº, or, for that matter, a range of [+0.5, +0.7] and thus a mean sensitivity of 3 Cº? Where are the calculations by which the authors arrived at their range from the observed “thermostasis”? They have shown none. The sum total of their support for that range is the bald assertion that “Fig. 5 and 810,000 years of thermostasis suggest” it. (Fig. 5 is just a closed-loop-gain equation-illustrating hyperbola on which they placed the “process engineers’ design limit” that Lord Monckton has flogged for years without providing any basis.) Almost none of the paper’s verbiage that precedes that range’s introduction has anything to do with arriving at it. In other words, the authors just made the range up. It’s as though I had said that my “finding” of a 50º F. outside temperature was based on physics because I contend that melting icicles suggest a Celsius range of [8º C., 12º C.]. It’s physics, I suppose, that the 50º Fahrenheit value corresponds to the mean of the [8º, 12º] Celsius range, but why would melting icicles suggest [8º C., 12º C.] rather than, say [1º C., 5º C.]? However true my estimate may ultimately turn out to be, it’s still just conjecture. I can’t believe the magnet thing didn’t win. To be fair, I haven’t read any of the articles… but I think that’s in the spirit of these kinds of articles, right?